Kakuna in game: 2,190 Who? Important notice! Pokemon Kakuna is a fictional character of humans. Kakuna (Japanese: ??—? Cocoon) is a dual-type Bug/Poison Pokémon. 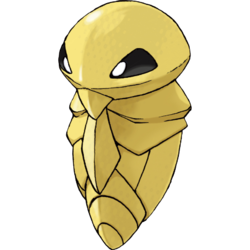 Kakuna is a yellow, cocoon Pokémon. Kakuna has a dome-shaped head and black, triangular eyes. It has two scythe-like arms in the middle of its body. When it comes close to evolving, its body gives off heat that makes it warm to the touch. Kakuna remains virtually immobile and waits for evolution often hanging from tree branches by long strands of silk. When attacked, however, it can extend its poison barbs. Kakuna nests in forests and misty wooded areas. Occasionally, it will also nest at the mouths of tunnels and caves as seen in Pokémon Snap. Kakuna appeared when Ash was in Viridian Forest in Challenge of the Samurai. When his Metapod was captured by Beedrill, it was kept near a hive of Kakuna. 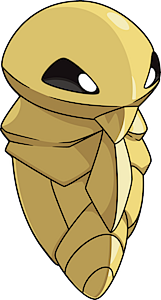 The Kakuna then evolved into Beedrill in defense of their hive. Kakuna also appeared in A Chansey Operation. A Kakuna appeared in Illusion Confusion! 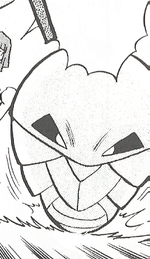 as an illusion created by Haunter and Gengar. Multiple Kakuna appeared in Mewtwo Returns. Multiple Kakuna were seen in the Azalea Gym in Gettin' The Bugs Out. A Kakuna appeared in The Grass-Type Is Always Greener!. A Kakuna appeared in a photograph in A Trainer and Child Reunion!. 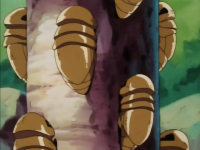 Multiple Kakuna appeared in Danger, Sweet as Honey!, instantly evolving into a swarm of Beedrill. A Kakuna appeared as a mask for the festival in Capacia Island UFO!. A Kakuna appeared in SM003, as a silhouette. Kakuna's first appearance is a cameo in Bulbasaur, Come Home! as one of the Pokémon that escapes from Professor Oak's Laboratory. In Murkrow Row another Kakuna appeared as one of the Pokémon in Gold's house, also known as the House of Pokémon. Bugsy uses two Kakuna on his team, one of them first appeared in Ursaring Major where it, a Metapod and Bugsy visited the Azalea Town's well where Team Rocket had been. Crystal captured a Kakuna on her way to Professor Elm's Lab in Three Cheers for Chikorita. 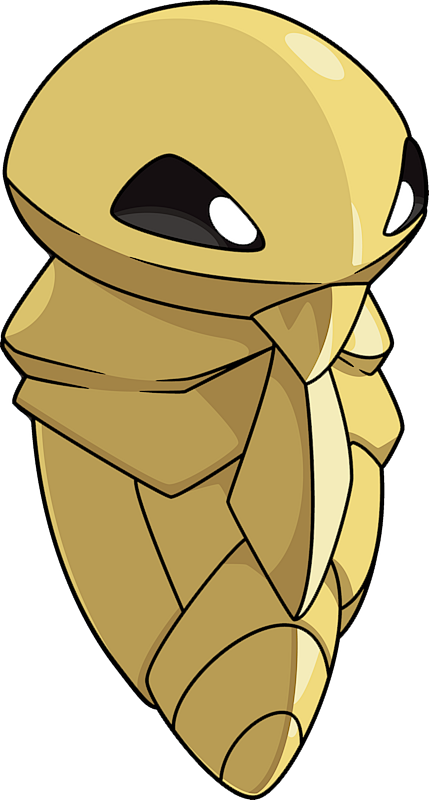 Later another Kakuna appeared in The Last Battle XIII as one of the Pokémon sent to help the fight in Ilex Forest. Cantonese Chinese ??? Tithokyúng Literally "Iron shell pupa"